Cait's Cozy Corner : Shop With Me Friday Favorites! Shop With Me Friday Favorites! This post is sponsored by Brand Backer. All opinions are my own. As a blogger, I feel so fortunate to work with so many great shops, boutiques and companies. I love helping increase activity and boost sales for shops who are so passionate about their products. I also love that I'm able to test out some of these products and share my favorites with you all. Come on and shop along with me today, plus I have some codes you can use to help save you money when you purchase from these stores. 1. OZ Natural Super Youth Eye Gel - I have the worst circles under my eyes and when I received this complimentary bottle to help cover up those circles, I jumped at the chance. Not only is this gel fast absorbing but it also doesn't leave the your skin feeling sticky or dried out. While this is a small bottle, I know it'll last me a while because I use the smallest drop for both eyes both morning and night. It's a must for you Mom's like myself that I need a little boost. 2. SouthernCharmsByJess - Aren't these bracelets just the cutest?! I couldn't get enough of the adorable style and love how they're so easy to stack with a fun watch or other bracelets. Plus, Jess is super sweet to work and captured my style perfectly. 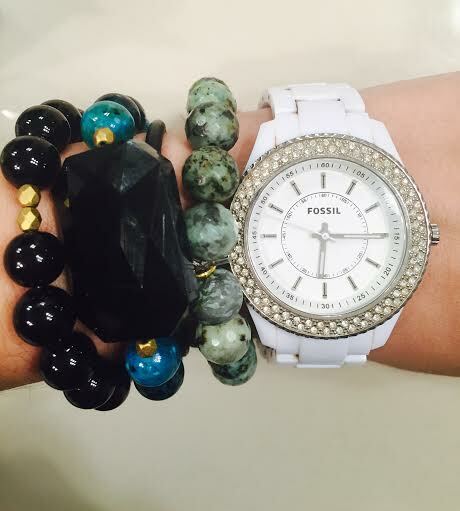 I can't get enough of these jade beads and this beautiful center bracelet. It'll be on repeat for the next few weeks I can tell you that! Use code LOVE20 for 20% off $100 or more! 3. Lil Haute Rod Boutique / Emma Lyn Designs- This boutique has some adorable and affordable pieces that I couldn't wait to share with you some of my favorites that I got. I love their "Good Vibes Only" shirt that's incredibly soft and their cozy sweater that transitions perfectly from winter to spring. You can save 20% when you use code CAITLOVESLHR at checkout. Oh, and that clutch is from EmmaLynDesigns. Her clutches are incredible and so fun to dress up and outfit. 4. Bip and Bop- Even though I love to have some chunky bracelets in my day to day wear, there are times I can't adore simple and delicate pieces too like the ones above. These bracelets are a current favorite right now but this store offers necklaces, earrings and so much more. I love how affordable they all are as well and make the perfect gift for a certain holiday on Sunday or a birthday/just thinking of you gift ;). You can save $5 off your order when you use code CAITLIN at checkout and you won't be disappointing! 5. UOI Boutique- This boutique has it all! From cute tumblers to gorgeous every day outfits and workout apparel, I can't say enough about this adorable shop. I may buy this store out you guys especially the sport bras and cute capri's to get me back into shape! You get to save 10% on your entire purchase when you use CAITLINMAR at checkout! Have fun! 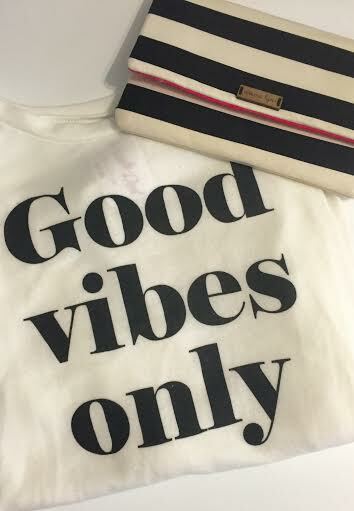 Stay tuned for a fun giveaway coming Sunday! Be sure to check my Instagram for news too this weekend! Hope you all enjoyed shopping with me today! Let me know what you're thinking of purchasing or if you have any questions, let me know in the comments below or e-mail me! What are some of your favorite stores to shop at? Ooohh I will be checking out that eye cream for sure! I need some serious help in that department! I've been following Bip and Bop forever and trying to decide what piece I want from them and it's so hard because I love everything! Those bracelets are so cute! Thanks for the great recommendations! Oh I love those gold delicate bracelets! So cute! I love OZ Naturals products and how adorable are those bracelets! I hope you have a lovely Valentine's Day weekend full of love and smiles on your pretty face! ah, those Bip and Bop bracelets are adorable!! Oh goodness I love those bracelets in number 4! SUPER cute! I love the throwback feel too. I had one just like that in middle school and it was my fave. I might have to buy one or 7. Hey girl! Those gold bracelets are so sweet and dainty! I love them! Have a great weekend! Thanks for stopping by my blog today :). I really do think potty training may be the hardest phase (so far) as a parent! Anyway, I'm loving those dainty bracelets! I'm a fan of big statement pieces too, but those are just so pretty! Both sets of bracelets are so pretty. I want them all!! Oh I need to check out that eye gel! I have never found anything that helped with my dark circles. Thanks for the recommendation! 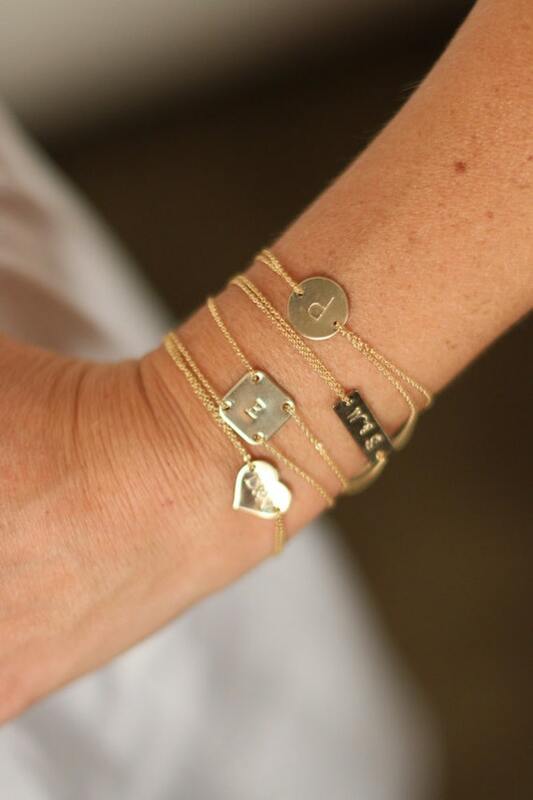 Love the gold bracelets and chunky bracelets-super cute!